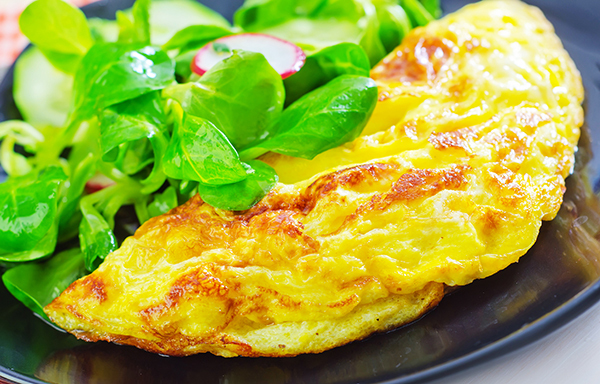 Our microwave makes short work of a comforting omelette. While a deliciously cheesy ham omelette is often billed as a simple comfort food, it can be very tricky to get right – as anyone who has had to serve scrambled eggs instead of an omelette can attest! Using our Steam Combi microwave oven, you have your perfect omelette in less than ten minutes, with no scraping, flipping or eggs that end up scrambled. Beat egg yolks, with milk and salt and pepper in a bowl. In a separate bowl, beat egg whites until soft peaks form. Gently fold egg whites through yolk mixture with cheese, ham and onion. Place onto a well-greased dinner plate. Stand for 2 minutes before folding in half. Made with Panasonic's NN-CS894S Steam Combi microwave oven: http://www.panasonic.com/au/consumer/household/microwave-ovens/nn-cs894s.html.